Florida Gov. 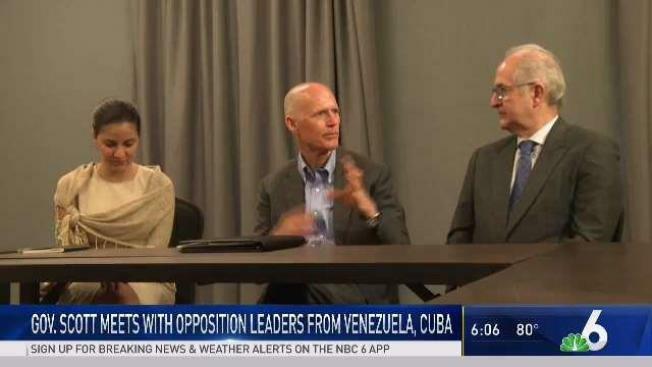 Rick Scott met priavtely Sunday with opposition leaders from Venezuela and Cuba. Scott will leave Monday on a trip his office said will be to give assistance and guidance to emergency workers and government officials. The trip comes less than two weeks after Scott announced he will run for U.S. Senate, challenging three-term Democratic Sen. Bill Nelson. Florida Republican Governor Rick Scott is making his fifth trip to Puerto Rico since Hurricane Maria devastated the island. Scott will leave Monday on a trip his office said will be to give assistance and guidance to emergency management workers and government leaders in the U.S. territory. The Puerto Rican vote could be a key in the election. Florida had a large Puerto Rican population before Hurricane Maria, and thousands have relocated to the state since the storm hit the island in September.